Summer is here, which means entertaining is a must. Whether you’re hosting a party or a small, intimate get together, bar carts are a stylish addition to your home decor. It’s a versatile piece that makes a great conversation-starter, but it can also help keep your drink-making essentials organized and stored all in one place. 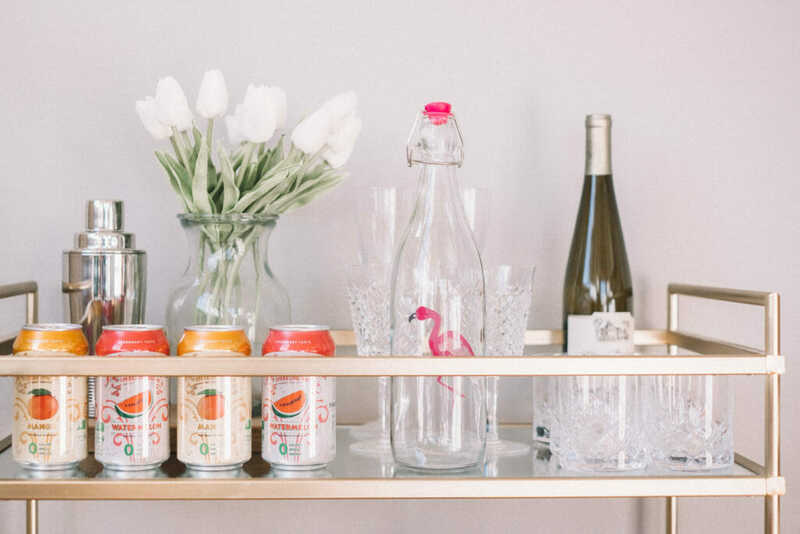 Here are some tips and tricks to make your summer bar cart a must-have item in your home. Whether you decide to buy your bar cart or revamp an old piece of furniture, you have to decide what barware you’re going to show off. If you happen to choose a bar cart that has wheels, it can be moved to any area in your house. Since it’s going to be a focal point in your home this season, you’ll want to make sure it matches the decor style throughout your entire home. 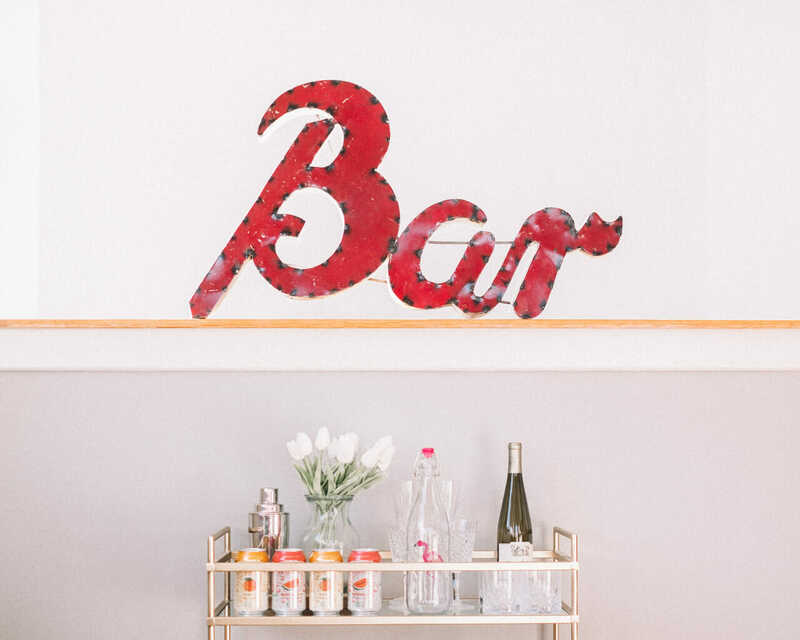 Depending on the specific style you identify with, there is a bar cart out there for you! I tend to find myself adding minimalist pieces to my home, so this mirrored gold bar cart from West Elm is a nice accent to the rest of our decor. If you aren’t sure what style you fall into or what will coordinate well in your home, online interior designers can help steer you in the right direction. The great thing about including a bar cart in your home is that you can show off your decorating skills. Don’t limit yourself to just the basics, such as wine glasses, mugs and, liquor. Colorful stir sticks, coasters, or wine glass tags are a great way to add unique little touches to your bar cart. You can even add some character to your bar cart by adding accessories that are non-drinking related. Add a floral arrangement that matches the color scheme of your bar cart. Or, if you’re planning on using your bar cart outside, look for a portable speaker and light combination, like this one here. The light will be helpful as the sun starts to set and the music will create a fun, relaxing atmosphere. This is the fun part! Have you ever found yourself at the grocery or liquor store admiring the bottles? They come in all shapes and sizes, and can easily be used as accent pieces to your bar cart. Combining a variety of shaped-bottles will look appealing to the eye. Depending on the size of your bar cart, decide how you want to display your bottles. If it looks overwhelming, a wine rack is a great option to store your bottles in an organized way. Don’t feel as though you need to include only liquor bottles on your bar cart. Add some flavored waters (Waterloo is my favorite) or soda bottles – a mocktail can be just as refreshing! As you’re planning on what drinks will be served on your bar cart, be sure you have all the necessary ingredients and accessories. If you’re hosting a party, sometimes a drink made ahead of time is a better option and results in fewer messes during clean up. Have a beverage dispenser on hand, to place on your bar cart for those types of gatherings. My go-to beverage during the Summer months is a orange juice, pineapple juice, Malibu Coconut rum, and a splash of Topo Chico. Once you’ve chosen your bar cart, the fun can really begin! It’s a great organizational piece to include in your home for all of your entertaining and refreshment needs. 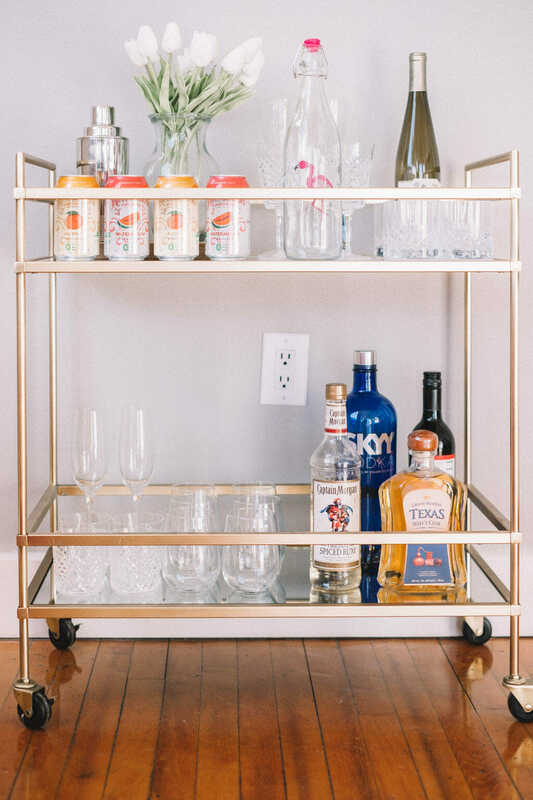 For more bar cart styling tips, check out this blog post from Havenly for some added inspiration. When can I come over for a cocktail or glass of rosé?! Love this Steph, so fresh and fun! We can’t wait to have you, Chris, and Eleanor over soon!! Let’s do another pot luck!